Linsitinib (OSI-906) is a selective inhibitor of IGF-1R with IC50 of 35 nM in cell-free assays; modestly potent to InsR with IC50 of 75 nM, and no activity towards Abl, ALK, BTK, EGFR, FGFR1/2, PKA etc. Phase 3. (e) c-peptide from these mice 240 min after respective treatments. NVP-AEW541 is a potent inhibitor of IGF-1R/InsR with IC50 of 150 nM/140 nM in cell-free assays, greater potency and selectivity for IGF-1R in a cell-based assay. (A) KRAS mutant (SW837 and LoVo) or KRAS/PIK3CA mutant (HCT-116) colorectal cancers were treated with the indicated compounds for 6 hours (gef, gefitinib 1 μM; NVP, NVP-AEW541 1 μM; PHA, PHA-665752 1 μM), and the resulting protein lysates were immunoprecipitated with an anti-p85 antibody. The precipitated proteins were analyzed by Western blots with the indicated antibodies. Whole cell extracts were probed with the indicated antibodies. Asterisks indicate the IRS proteins for SW837 and HCT-116 cells, and ERBB3 for LoVo cells. (B) SW837 cells were grown in either normal serum (5% FBS) or low serum (0.5% FBS) and treated with vehicle, R1507 anti–IGF-IR antibody (25 μg/ml), or NVP-AEW541 (1 μM) for 6 hours. The cells were lysed and probed with the indicated antibodies. GSK1904529A is a selective inhibitor of IGF-1R and IR with IC50 of 27 nM and 25 nM in cell-free assays, >100-fold more selective for IGF-1R/InsR than Akt1/2, Aurora A/B,B-Raf, CDK2, EGFR etc. (E) The level of migration ability of HEC-1B cells treated with insulin, GSK1904529A, and the silencing of DHCR24 was determined using a transwell assay. 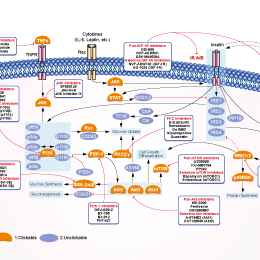 (F) The invasion ability of HEC-1B cells treated with insulin, GSK1904529A, and silencing of DHCR24 was probed. The data are presented as the mean ± SD of three independent experiments. (*p < 0.05; **p < 0.01; ***p < 0.001). NVP-ADW742 is an IGF-1R inhibitor with IC50 of 0.17 μM, >16-fold more potent against IGF-1R than InsR; little activity to HER2, PDGFR, VEGFR-2, Bcr-Abl and c-Kit. BMS-536924 is an ATP-competitive IGF-1R/IR inhibitor with IC50 of 100 nM/73 nM, modest activity for Mek, Fak, and Lck with very little activity for Akt1, MAPK1/2. A, cell viability reduction. TC1889 cells were treated with pharmacological inhibitors against IGF-1R (NVP and BMS), as well as a neutralizing IGF-1R antibody (aIR3) and cell viability was assessed using MTT-assays. Mouse IgG1 antibody was employed as a reference control for the effects of aIR3 at respective concentrations. Assays were performed in sextuple. Data are expressed as the mean SD (n 3). B, induction of cell death. TC1889 cells were treated with pharmacological inhibitors against IGF-1R as well as a neutralizing IGF-1R antibody and cell death was evaluated by FACS-analyses following PI-staining. Data are expressed as the mean SD (n =3). (A) CLL B cells purified from freshly isolat ed or freeze-thawed PBMCs from CLL patient samples were treated with a single dose of 15 µM AG1024, 1µM PPP or 1µM linsitinib for 24h and cell survival was determined by flow cytometry. Results are shown as mean ± SEM, n=20. (B)CLL B cells purified from freshly isolat ed or freeze-thawed PBMCs from CLL patient samples were treated with a single dose of 15 µM AG1024 (AG) or 1µM linsitinib (L) and immunoblotted for the expression of phosphorylated IGF1R and IRS-1 (n=6). (C) CLL B cells purified from freshly isolat ed or freeze-thawed PBMCs from CLL patient samples were treated with a single dose of 1µM PPP and immunoblotted for the expression of phosphorylated IGF1R and IRS-1 (n=4). (D) CLL B cells purified from freshly isolated or freeze-thawed PBMCs from CLL patient samples were treated with 5-15 µM AG1024 and subject to a Western blot analysis using the indicated antibodies. Results are represented as mean±SEM (n=10). Supplementary Figure 1C shows the associated densitometrical analysis after treatment with 15 µM AG1024. (E) CLL B cells purified from freshly isolat ed or freeze-thawed PBMCs from CLL patient samples were treated with 10-500nM rhIGF-1 and immunoblotted for the expression of IGF1R, pIGF1R, pAkt, Akt, pERK and Erk. A representative example from four independent experiments is shown. PQ401 inhibits autophosphorylation of IGF-1R domain with IC50 of <1 μM. PQ401 induces apoptosis in glioma cells. (A) U87MG cells were treated with PQ401 at the indicated concentrations for 48 hours, followed by PI staining and flow cytometry analysis. * indicates P < 0.05 by one-way ANOVA followed by Dunnet's test for comparisons between PQ401 treatments with various doses and no PQ401 treatment group. (B) U87MG cells were incubated with PQ401 for 48 hours. The nuclei were stained with Hoechst and analyzed using a fluorescent microscope. The representative images are presented. (C) The number of cells with condensed/fragmented nuclei was quantitated by counting in seven random fields and the inhibition was calculated. * indicates P < 0.05 by one-way ANOVA followed by Dunnet's test for comparisons between PQ401 treatments with various doses and no PQ401 treatment group. NT157, a selective inhibitor of IRS-1/2(insulin receptor substrate), has the potential to inhibit IGF-1R and STAT3 signaling pathways in cancer cells and stroma cells of TME leading to a decrease in cancer cell survival. Picropodophyllin (PPP) is a IGF-1R inhibitor with IC50 of 1 nM. It displays selectivity for IGF-1R and does not coinhibit tyrosine phosphorylation the IR, or of a selected panel of receptors less related to IGF-IR(FGF-R, PDGF-R, OR EGF-R). (E): Expression levels of NANOG and p-IGF-IR were measured by immunoblotting in HCT116 and SW620 cells after treatment with IGF-II or PPP.